The study, conducted by Tawhid Chtioui, Professor & Dean at emlyon business school Africa, alongside colleagues Prof. Mehdi Nekhili and Prof. Héla Chakroune*, evaluated the impact of appointing a female CEO or Chair ona firm’s performance, for both family and non-family firms. The researchers sampled 394 French firms over the period of 2001-2010, and reviewed the appointments made to CEO and Chair positions, and the subsequent impact on performance. The researchers evaluated the appointments’ impact using two performance indicators; return on assets and Tobin’s Q,a market-based measure of firm performance, potential growth opportunities and future performance. Though the researchers found that appointing a female CEO produced a positive reaction for non-family firms, family firms experienced a negative impact to both performance indicators. “The difference in impact of appointing a female CEO between non-family and family firms is likely due to two distinct reasons. The first being that family businesses have a smaller management recruitment pool, therefore female CEOs may be appointed due to family ties and not experience or talent, therefore negatively effecting performance. However, the researchers found that hiring a female Chair had the complete opposite effect, proving valuable for family firms but not for non-family firms. 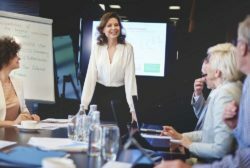 “This is likely due to women typically bringing a collaborative leadership style to the Chair role, which benefits boardroom dynamics more in family firms than non-family businesses. Female Chairs are also more likely to implement a transformational leadership style, that better embraces family business’ values, needs and characteristics”. This is the first study to simultaneously examine the relationship between female leadership, family ownership patterns and firm’s performance. The results of which were published in the Journal of Business Ethics. *Mehdi Nekhiliis professor at Maine University and ICD International Business School (France)and Héla Chakrouneat the Institute of Higher Business Studies, University of Sfax (Tunisia).